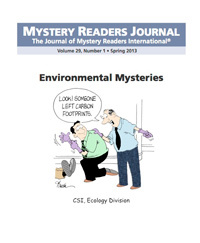 I never intended to write what anyone would describe as an environmental mystery. But no sooner had my first novel been published than it was described by some as just that. Bob’s idea is to cross-breed different species of assassin bugs (real, predacious insects from the family Reduviidae) to create an all-natural means of controlling cockroaches. Later in the story, Bob explains to a potential investor that one of the biggest manufacturers of household pesticides has had to alter their formula 34 times in 29 years because of how quickly insects develop resistance. He also talks about the potential nerve damage to children and pets caused by the relentless exposure to these deadly chemicals in the environment. I can’t swear to it but Bob might even cite Silent Spring somewhere in his pitch. There could also be a passing mention of the Clean Water Act of 1972, but other than that, the book is concerned about a series of wild, comedic chases through the boroughs of New York while this nutty scientist pursues his harebrained experiments (while being pursued by a dozen professional killers) before befriending a depressed gambling addict who happens to be the world’s best assassin. Oh, and there’s a British, cross-dressing dwarf in there somewhere as well. So can 100 words out of 90,000 make a book pro-environmental? I’ll let you decide. It seems to me you could just as easily (and incorrectly) characterize the novel as a pro-business, pro-entrepreneur story about a guy with a dream to start his own company; an ode to capitalism, as it were, what you might get if you mixed Ayn Rand with insects and assassins. In The Exterminators (the sequel to Pest Control) we return to the issue of the environment by way of religion and politics, more specifically, the rise and fall of a few strains of so-called “end-time” evangelical Christian politicians (those known as dispensationalists, reconstructionists, and dominionists, among other names). This group of ultra-conservatives point to their interpretation of scripture as the basis for proposing that we get rid of all legislation that protects the environment. Their logic being that if the end-times are upon us then we need not concern ourselves with the environment. Indeed, some even argue that the sooner we destroy our environment, leading to the Apocalypse, the sooner Jesus will return. That their legislative proposals happen to favor the corporations that fund the re-election campaigns of these politicians is, they would assure us, a complete coincidence and you’d be an American-hating, anti-Christian cynic for saying otherwise. And if that paragraph doesn’t tell you The Exterminators is more of a political and religious satire than an environmental mystery, I don’t know what will. My second novel, The Organ Grinders, is set in the world of medical biotechnology, more specifically in the world of xenografting, the science of transplanting organs from one species of animal into another. Still, for all the environmental issues raised in The Organ Grinders, the book isn’t an argument about going solar or driving hybrids or composting, thrilling as those topics might be. Ultimately the book attempts to address a question about science, making the point that: just because we are able to do something doesn’t mean we should do it. While Heart Seizure revisits the subject of organ transplantation, it’s done in the context of a pure political satire. Elsewhere in my oeuvre you’ll be hard-pressed to find anything you could construe as environmentally oriented. But you are welcome to try. Bill Fitzhugh is the award-winning author of nine novels, variously described as humorous mysteries, comic thrillers, and satires. His most recent is The Exterminators, the sequel to Pest Control. He has a YouTube channel featuring book trailers and other comedy- related material he has produced. Plagues, pesticides and perdition. These are what I think of when I think of the latest themes in thrillers (mine included). The threatened ecosystem is a current trend in fiction and one that I don’t see changing, because the consequences and looming decisions that we all will have to make to place the world back into balance. With antibiotic use causing superbugs, global warming creating hot spots, catastrophic weather events, and our use of pesticides these fears are real, not fictional. Perdition, of course, is where we’re afraid we’ll end up when humankind has managed to destroy our world. I’ve been fascinated by the power of nature to overcome artificial barriers for a long time. One of the first lawsuits that I worked on as a brand new associate was a class action lawsuit filed after milk sold in grocery stores sickened over twenty thousand people with salmonella poisoning. The dairy that sold the milk shut it down, disinfected it by cleaning every inch and running cleaning solutions through the tubes and on every surface imaginable before reopening. The result? A second round of tainted milk. After multiple attempts that were almost heroic in their thoroughness, the dairy, a brand new state of the art facility, was closed permanently. The tiny, microscopic bacteria had won. My take away was that we can puff up our chests all we want, act like we’ve got it all under control, run bleach through the a facility to kill bacteria and build dams and sandbag barriers until we drop in exhaustion, but when an epidemic, virus, superbug, hurricane, tornado, tsunami or other force of nature hits we’re often powerless. Nature’s supremacy won’t be denied. In my latest thriller, Dead Asleep (Harper, 2012), I included two of these undeniable forces of nature as the underpinning of the story. The first was the disease that Emma Caldridge, my chemist protagonist, encounters in the novel. Called encephalitis lethargica, it’s a disease that makes you fall into a sudden sleep. During the sleep you either die or, if you wake up, often exhibit bizarre physical quirks and mental psychosis. The disease killed almost five million people in 1915 before disappearing as mysteriously as it appeared. Scientists never figured out the cause, whether it’s from a virus or bacteria, nor have they been able to cure it. In fact, an earlier reappearance in the middle ages may have been the genesis for the Sleeping Beauty legend. Emma meets with this disease while on a tropical island. When the island is quarantined, she is stuck there with some very dangerous characters. The second theme in the novel was the futility of fighting against nature. At one point in the book Emma must dive the blue holes, famous underwater caves found in the Bahamas, but that I move, for convenience’s sake, near the fictional island that she inhabits. Underwater cave diving is an extreme sport. Not all caves are mapped, and even those that are can be a challenge to navigate. A series of caves near Egypt contain almost forty bodies of divers that have died attempting to swim them. These caves are the Mount Everest for divers, with the resulting risk of death. Even though Emma is an ultra runner and an excellent athlete, she experiences an effect during the dive that can hit at any moment and can’t be avoided with either training or drugs. Once again, the environment wins. I believe that at their best, thrillers should entertain us, and a good thriller writer finds something that triggers a fear and explores that fear with a great story. In the case of eco-thrillers, that fear has a basis in reality, and if we learn something in the process about our environment when we read one, so much the better. In the meantime, I hope you enjoy the story! Jamie Freveletti is a trial attorney, martial artist, and runner. She has represented clients in areas ranging from class actions for mass salmonella poisoning to securities fraud. She was tapped by the Estate of Robert Ludlum to write the next in the Covert One series, The Janus Reprisal (Grand Central Publishing, 2012). She currently lives and writes in Chicago with her family.